Many of the toys that Victorian children played with were home-made. They included dolls, kites and carts. However, there were also many more sophisticated toys such as kaleidoscopes and zoetropes. 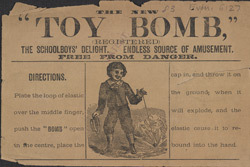 The 'Toy Bomb' advertised in this leaflet was very similar to the modern yo-yo.